London & South East Premier (up until 2016-17 known as National League 3 London & South East) is a level five league in the English rugby union system. It is one of four leagues at this level, with its counterparts; South West Premier, Midlands Premier and North Premier. The format of the league was changed at the beginning of the 2009–10 season following re-organisation by the Rugby Football Union while the name change from National League 3 to Premier was introduced for the 2017-18 season to make it more obvious that it is a regional league. London & South East Premier is the highest regional rugby union league covering London and south east England. The club that finishes in first place is automatically promoted to National League 2 South. The runner-up meets the second placed team of South West Premier with the winner also gaining promotion. Relegated teams drop down to either London 1 North or London 1 South depending on location, and other factors such as the location of relegated and promoted teams in other divisions. Nine of the fourteen teams participated in last season's competition. They are joined by Wimbledon who were relegated from National League 2 South, along with four promoted sides; Bedford Athletic, Brentwood, Chingford and CS Rugby 1863. Bedford Athletic had initially been promoted into Midlands Premier but were level transferred into London & South East Premier as the nearest club geographically to address an imbalance of teams in the league. Teams leaving the division included Barnes who were promoted into National League 2 South as champions along with Guernsey who won the promotion playoff, while teams relegated from the league included Southend Saxons (London 1 North), Towcestrians (Midlands 1 East) and Westcombe Park (London 1 South). Nine of the fourteen teams participated in last season's competition. They are joined by Barnes who were relegated from National League 2 South along with three promoted teams Sidcup, Tring and Tunbridge Wells. Tonbridge Juddians were promoted into National League 2 South as champions along with Wimbledon who won the promotion playoff. Teams relegated from the league included Amersham & Chiltern and Colchester (London 1 North) and Chichester (London 1 South). To address an imbalance of teams, Towcestrians were level transferred into the league from the Midlands Premier, as they were the nearest team geographically. Green background is the promotion place. Blue background is the play-off place. Pink background are relegation places. Each season, the runners-up in the London & South East Premier, and South West Premier participate in a play-off for promotion to National League 2 South. The team with the best playing record, in this case Guernsey RFC, hosted the match and beat their opponents Bournemouth 38 – 23 to win promotion. Nine of the fourteen teams participated in last season's competition. They are joined by Dorking and Southend Saxons who were relegated from National 2 South while three promoted teams, Amersham & Chiltern, Guildford and Sutton & Epsom were promoted into the league. London Irish Wild Geese were promoted to National League 2 South as champions while Eton Manor and Gravesend were relegated to London 1 North and London 1 South respectively. Originally, Westcliff were supposed to go down as the 14th placed team, but they were granted a reprieve when East Grinstead (who had finished 3rd) decided to take voluntary relegation, due to the loss of a key sponsor and dropped five leagues to Sussex Spitfire 1. Finally Bracknell were level transferred back to National League 3 South West after just one season to address an imbalance in teams after having finished 11th. Each season, the runners-up in the National League 3 London and SE, and National League 3 South West participate in a play-off for promotion to National League 2 South. The team with the best playing record, in this case Wimbledon RFC, hosted the match and beat their opponents Dings Crusaders RFC 55 – 5 to win promotion. ^ Despite finishing 3rd in the league, East Grinstead decided to take voluntary relegation due to being left insolvent after their director (and financial backer) pulled out of the club. They will be relegated all the way down to level 10 (Sussex Intermediate League) giving a reprieve to Westcliff who would have been relegated in 12th position had it not been for East Grinstead's demotion. ^ Following East Grinsteads voluntary relegation, 12th placed Westcliff were granted a reprieve and would not be relegated this season. The runners-up in the National League 3 London and SE, and National League 3 South West participate in a play-off for promotion to National League 2 South. The team with the best playing record, in this case Tonbridge Juddian, host the match and their opponents are Barnstaple. Juddians lost the match 31 – 30 to a penalty in the last minute of the match and will stay in National 3 London and SE for next season. The runners-up in the National League 3 London and SE, and National League 3 South West participate in a play-off for promotion to National League 2 South. The team with the best playing record, in this case Exmouth, hosts the match; their opponents were Barnes and the match was played on 25 April 2015. At the end of full-time the match score was 22 – 22, and Barnes scored the only points in extra-time, to win the match 27– 22. In the first season of the English rugby union league pyramid, sponsored by Courage, there was four, tier five leagues. These were London Division 1, Midland Division 1, North Division 1 and South West Division 1. 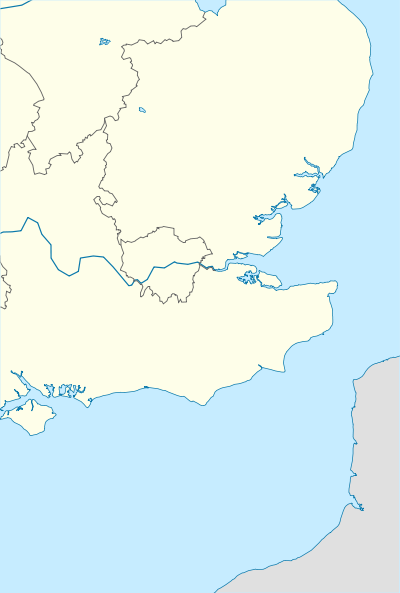 In 1987 the geographical area for teams in the south-east of England was known as the London and South East Division and covered the counties of Essex, Hampshire, Kent, Middlesex, Norfolk, Suffolk, Surrey and Sussex. The league was also known as London League 1 and London 1. There were eleven teams in the league and they played each team once, giving each team ten matches. This system prevailed for five seasons, and in 1992–93 the number of teams increased from eleven to thirteen. The following season (1993–94) the league was reorganised and the four tier five leagues became two; National 5 North and National 5 South. After three seasons, in 1996–97, a further reorganisation occurred, and there was a return to four, tier five leagues; with London Division One covering the same area as before. This system prevailed until 2009–10 when the number of teams was increased from twelve to fourteen and renamed National League Three London & South East. The league name changed once more for the 2017-18, when it was renamed to London & South East Premier. The top six teams from London Division One and the top six from South West Division One were combined to create National 5 South. London Division 1 was now the name of a tier six league and was one of two feeder leagues for National 5 South. National 5 South was split and renamed London Division One and South West Division One, and the top four divisions increased in size. Lydney was promoted to National Division Three and all of the other teams, bar Camborne, were transferred to the tier four, National 4 South. The division was renamed National League 3 London & SE following a restructuring of the national leagues which led to changes at all levels. Green background are the promotion places. The division was renamed London & South East Premier in order to make it more obvious that it was a regional league and the pinnacle of the London & South East region. Since season 2000–01 there has been a play-off between the runners-up of London & South East Premier and South West Premier for the third and final promotion place to National League 2 South. The team with the superior league record has home advantage in the tie. At the end of the 2017–18 season the London and south-east teams have been the most successful with twelve wins to the south-west teams six; and the home team has won promotion on fourteen occasions compared to the away teams four. Green background is the promoted team. (LSE = London & South East teams while SW = South West teams). ^ The reduction of this division from 17 teams to 12 resulted in more relegation places than is usual. ^ Metropolitan Police withdrew and their fixtures and results expunged. ^ Despite finishing 3rd in the league, East Grinstead decided to take voluntary relegation due to being left insolent after their director (and financial backer) pulled out of the club. The will be relegated all the way down to level 10 (Sussex Intermediate League) giving a reprieve to Westcliff who would have been relegated in 12th position had it not been for East Grinstead's demotion. ^ London Welsh's league title was won during the period when tier 5 was divided into 2 regional divisions - National 5 North and National 5 South (1993-96). ^ a b c "Renaming of RFU National 3 Leagues". Oxfordshire RFU. Retrieved 16 July 2017. ^ "National League South". The RUGBYPaper (450). Rugby Paper Ltd. 30 April 2017. pp. 32–33 & 37. ^ "Sidcup RFC secure league title and promotion with three games to spare". Sidcup RFC (Pitchero). 26 March 2017. ^ "2016-2017 London & South-East Division". England Rugby. RFU. Retrieved 22 April 2017. ^ "Chingford 33 Tunbridge Wells 35". Tunbridge Wells RFC (Pitchero). 29 April 2017. ^ "TJs Crowned N3L&SE Champions". Tonbridge Juddians RFC. 22 April 2017. ^ "National 3 round up". The RUGBYPaper (450). Rugby Paper Ltd. 30 April 2017. p. 33. ^ "National League 3 2017-18". England Rugby. Rolling Maul. 3 May 2017. ^ a b Harvey, Neale (22 May 2016). "Talking Rugby". Sunday Independent (Plymouth). p. 62. ^ a b c "Rugby club director who left club after row took everything he ever paid for with him including gym equipment, the scoreboard and even the DOORS". The Sun. 11 May 2016. ^ a b c "Tumbling East Grinstead plot a way back". East Grinstead Courier. 25 May 2016. ^ "Senior leagues". Bracknell Rugby Club. 16 May 2016. ^ "National League Three Round-up". The RugbyPaper (378). 1 May 2016. p. 37. ^ "Exmouth's promotion hopes shattered with extra-time play-off defeat to Barnes". Express & Echo. 26 April 2015. Retrieved 4 May 2015. ^ "Results". The RUGBYPaper. 27 April 2014. p. 33. ^ a b c d Williams, Tony; Mitchell, Bill (eds.). Courage Official Rugby Union Club Directory 1991–92 (4th ed.). Taunton: Football Directories. ISBN 1 869833 15 5. ^ a b Jones, Stephen; Griffiths, John (1994). Rothmans Rugby Union Yearbook 1994–95 (23rd ed.). London: Headline Book Publishing. pp. 163–179. ISBN 0 7472 7850 4. ^ Mick Cleary, ed. (1997). Rothmans Rugby Union Yearbook 1997–98 (26th ed.). London: Headline Book Publishers. ISBN 0 7472 7732 X. ^ Johns, Stephen; Griffiths, John (1988). Rothmans Rugby Union Yearbook 1988–89 (17th ed.). London: Rothmans Publications Ltd. pp. 123–139. ISBN 0 356 15884 5. ^ Jones, Stephen; Griffiths, John (1992). Rothmans Rugby Union Yearbook 1992–93. London: Headline Book Publishing. pp. 170–185. ISBN 0 7472 7907 1. ^ Jones, Stephen; Griffiths, John (1993). Rothmans Rugby Union Yearbook 1993–94 (22nd ed.). London: Headline Book Publishing Ltd. pp. 151–167. ISBN 0 7472 7891 1. ^ Cleary, Mick (1995). Rothmans Rugby Union Yearbook 1995–96 (24th ed.). London: Headline Book Publishing. pp. 179–195. ISBN 0 7472 7816 4. ^ a b Cleary, Mick; Griffiths, John (1996). Rothmans Rugby Union Yearbook 1996–97 (25th ed.). London: Headline Book Publishing. pp. 150–163. ISBN 0 7472 7771 0. ^ Cleary, Mick; Griffiths, John (1997). Rothmans Rugby Union Yearbook 1997–98. London: Headline Book Publishing. pp. 87–100. ISBN 0 7472 7732 X. ^ Cleary, Mick; Griffiths, John (1998). Rothmans Rugby Union Yearbook 1998–99. London: Headline Book Publishing. pp. 84–98. ISBN 0 7472 7653 6. ^ "1998–1999 London South-East Division". England Rugby. Retrieved 10 June 2016. ^ "1999–2000 London South-East Division". England Rugby. Retrieved 10 June 2016. ^ "2000–2001 London South-East Division". England Rugby. Retrieved 10 June 2016. ^ "2001–2002 London South-East Division". England Rugby. Retrieved 10 June 2016. ^ "2002–2003 London South-East Division". England Rugby. Retrieved 10 June 2016. ^ "2003–2004 London South-East Division". England Rugby. Retrieved 10 June 2016. ^ "2004–2005 London South-East Division". England Rugby. Retrieved 10 June 2016. ^ "2005–2006 London South-East Division". England Rugby. Retrieved 10 June 2016. ^ "2006–2007 London South-East Division". England Rugby. Retrieved 10 June 2016. ^ "2007–2008 London South-East Division". England Rugby. Retrieved 10 June 2016. ^ "2008–2009 London South-East Division". England Rugby. Retrieved 28 June 2016. ^ "2009–2010 London South-East Division". England Rugby. Retrieved 10 June 2016. ^ "2010–2011 London South-East Division". England Rugby. Retrieved 10 June 2016. ^ "2011–2012 London South-East Division". England Rugby. Retrieved 10 June 2016. ^ "2012–2013 London South-East Division". England Rugby. Retrieved 10 June 2016. ^ "2013–2014 London South-East Division". England Rugby. Retrieved 10 June 2016. ^ "2014–2015 London South-East Division". England Rugby. Retrieved 10 June 2016. ^ "2015–2016 London South-East Division". England Rugby. Retrieved 10 June 2016. ^ "2016–2017 London South-East Division". England Rugby. 29 April 2017. ^ "2017–2018 London South-East Division". England Rugby. 21 April 2018. ^ "2018–2019 London South-East Division". England Rugby. 13 April 2019. ^ "London & SE Division Play-Offs". England Rugby. 27 April 2002. ^ "London & SE Division Play-Offs". England Rugby. 28 April 2003. ^ "It's play-off agony for Reading". Get Reading. 28 April 2003. ^ "London & SE Division Play-Offs". England Rugby. 24 April 2004. ^ "London & SE Division Play-Offs". England Rugby. 30 April 2005. ^ "London & SE Division Play-Offs". Worthing Herald. 2 May 2005. ^ "London & SE Division Play-Offs". England Rugby. 29 April 2006. ^ "London/SW Play off Match overview Richmond VS Clifton". Rugby Statbunker. 29 April 2006. ^ "London & SE Division Play-Offs". England Rugby. 28 April 2007. ^ "Ealing Trailfinders 48 Cleve 16". Ealing Today. 3 May 2007. ^ "London & SE Division Play-Offs". England Rugby. 26 April 2008. ^ "Raiders' Play-off glory". Worthing Herald. 28 April 2008. ^ "London & SE Division Play-Offs". England Rugby. 25 April 2009. ^ "Barnes RFC 39 Bracknell RFC 18". Get Reading. 30 April 2009. ^ "London & SE Division Play-Offs". England Rugby. 17 April 2010. ^ "Pointon has mixed emotions after play-off defeat". Gloucester Citizen. 19 April 2010. ^ "London & SE Division Play-Offs". England Rugby. 25 April 2011. ^ "British Lion backs promoted Hertford". Hertfordshire Mercury. 25 April 2011. ^ "London & SE Division Play-Offs". England Rugby. 28 April 2012. ^ "Tonbridge Juddians miss out on promotion to National 2 South after play-off defeat to Chinnor". Kent Online. 30 April 2013. ^ "London & SE Division Play-Offs". England Rugby. 27 April 2013. ^ "Dorking suffer late heartbreak in Devon". Surrey Mirror. 27 April 2013. ^ "London & SE Division Play-Offs". England Rugby. 26 April 2014. ^ "Old Elthamians 17 Redingensians 10". Old Elthamians RFC. 26 April 2014. ^ "London & SE Division Play-Offs". England Rugby. 25 April 2015. ^ "Exmouth's promotion hopes shattered with extra-time play-off defeat to Barnes". Exeter Express & Echo. 26 April 2015. ^ "London & SE Division Play-Offs". England Rugby. 30 April 2016. ^ "Tonbridge Juddians 30-31 Barnstaple: National Three play-off match report". North Devon Journal. 30 April 2016. ^ "Reynolds' half-time blast does the trick". Guernsey Press. 30 April 2018.